We take a look at some hair colors that are well suited for cool skin tones. Choosing a hair color is so important for your overall image. We take a look at some hair colors that are suited for cool (fair, medium and dark) skin tones. If you have cool fair skin, you may find that many hair colors are too warm and brassy against your face. The key to the perfect color for your skin is sticking red, blue or ash based tones that will compliment your naturally fair and cool (pink-based) skin. Whether you want blonde, brown or red hair, there is a shade that is perfect for your skin tone. Check out these celebrity colors for inspiration. Abigail Breslin looks fantastic in this dark red-brown color hairstyle because it harmonizes with her pink-based skin tone. This rich color brings out her rosy cheeks and highlights her blue eyes. Dita Von Teese has created her signature look by pairing her fair cool skin with jet black locks. This is a dramatic look, but it can be pulled off if you are dedicated to glamming yourself up everyday - this color combo doesn't work so well for the natural look. Olivia Wilde has chosen a gorgeous shade of brown to offset her blue eyes and porcelain skin. 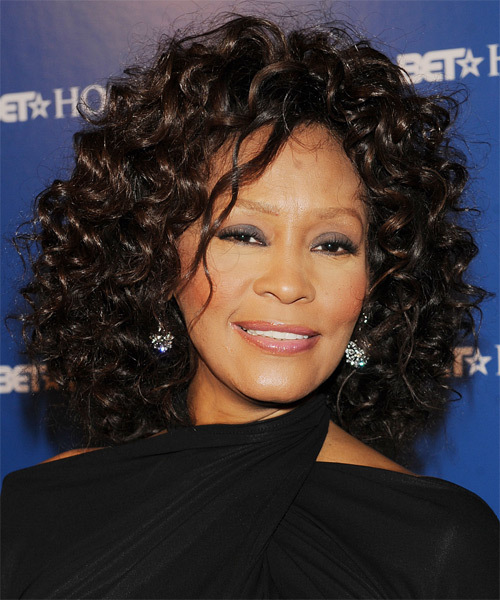 This neutral shade of brown works well because it is not too golden or brassy for her skin. Patricia Arquette shows us how good blonde can look with cool fair skin. Her icy blonde shade looks fantastic with her skin tone and brings out her light blue eyes. Medium skin tones usually have a warm undertone to them, but some women have a neutral or cool base to their complexion. This means that colors that look good on their warm-toned counterparts may not look so hot on them. If you have medium cool skin, check out these hair colors for inspiration. Christina Milian wears an ashen dark brown hair color here to flatter her cool skin tone. It also matches her eye color nicely, not to mention her icy grey eye shadow! Tila Tequila has a creamy pink undertone to her skin, which looks best with cool-toned hair. Her jet black hair is an ideal shade for her skin because it has a cool blue base. Her berry pink lips finish off this chic look. Nelly Furtado chooses a chestnut brown shade for her hair. Her base color is a neutral brown, but she has added subtle golden brown highlights which can work on cool skin if they are placed away from the face, as Nelly's are. Miranda Kerr looks stunning in this cool brown shade. If you are looking for a no-fuss hair color, this cool mocha brown may be the answer! Most dark skin has a warm base to it, but there are women with dark skin that have an ashen undertone to it. If you fall into this category, you may feel like your hair color choices are limited - black or dark brown. While this may be true, it is also worth noting that these colors can look stunning if your hair is in good condition, which can bring a glow to your entire face. So first thing's first - take good care of your hair! Here are some celebs with cool dark skin that are worth taking a look at. 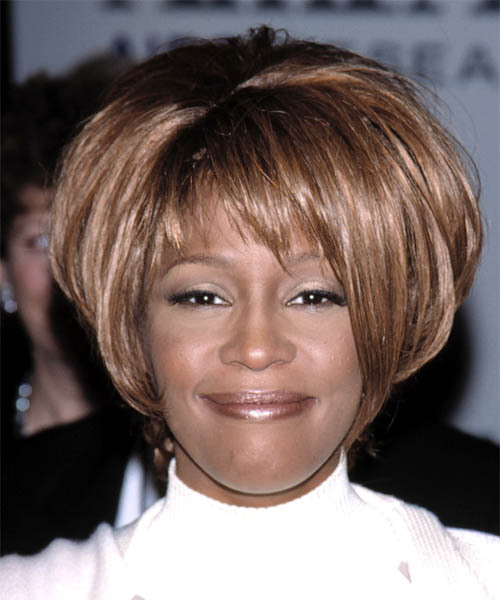 Whitney Houston's skin looks ruddy here because she has chosen a brassy copper color which clashes with her cool skin tone. On the other hand, when Whitney changes to a cool dark brunette color, her complexion immediately looks warmer and with a healthy glow. If you are thinking about experimenting with a light warm color like copper, consider the dramatic results that we see on Whitney here! 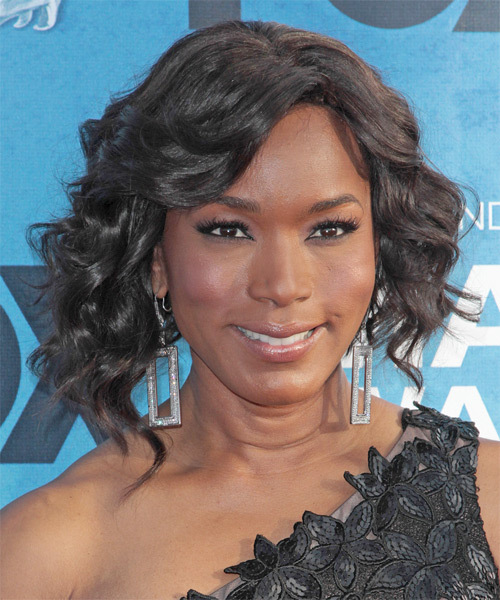 Angela Bassett also has ashen undertones to her skin, which looks fabulous next to her ash-black hair. This color gives a lot of sheen to her locks and makes her dark eyes pop. If you have a Warm skin tone, please read the article "Hair Colors for warm Skin Tones"